I am back in Bristol for a few days and was wandering back from lunch with Joshua when we happened to pass the Conservative Club. The door was open and i was conscious that I needed to renew my father's membership. Though not a Tory, or indeed a Bristol resident, he likes the idea of being able to access cheep beer at a place not far from our house. Thus, while spending £16 on the renewal, delighting in the idea of pinning Dad's membership card up on a wall at Shipston just to annoy my pious left wing public sector employed sisters, I asked if anyone was in the office upstairs which the Conservative Party uses at election time. It seems not. They must have been obeying the election halt called by Mrs May after the Manchester attacks. "Shame" said I, "Joshua and i were hoping to pick up a poster." Luckily the lady said that they had a selection behind the bar. I eschewed ones celebrating Mrs May, I wanted to have lots of blue and the word Conservative on it, in order to really ensure that the Mrs (Labour voting, Guardian reading sociology lecturer) was annoyed as much as possible. 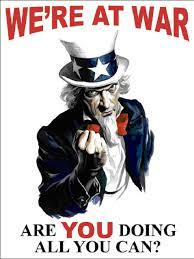 We on the right believe in freedom of expression but the Mrs points out that she owns the house and I am only a lodger and has thus barred myself and Joshua from displaying our nice new poster. This is regrettable - should I refuse to pay my rent? Eight month old Joshua appears to want to nibble the poster which I take as a sign that he is a good Tory. Remember my son: greed is good. 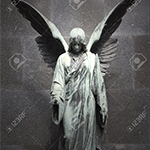 I want to put it in the window of the spare room which is where myself and Oakley are sent when one or other or both of us are in the doghouse. But the Mrs is not for turning. 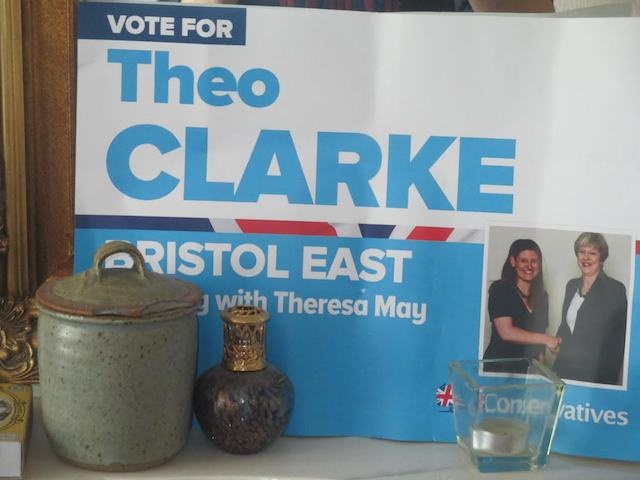 So it has been agreed that my poster - for the drippy remoaning local Tory Theo Clarke who does not appear to support any Tory principles at all - can stay in the room where I work. Pro tem that is the front room as you can see below and it can be seen from the Street. As of next week it will be on show in the Greek Hovel where no-one will see it other than myself and my Albanian workforce. But for the next few days, as the Mrs watches TV at night, there it sits glaring down on her, urging her to do the decent thing on June 8. Go on dearest... you know it makes sense.